While the study of the mind and behavior may be a subject as old as time, psychology has not always existed as it does today. Most experts actually consider psychology itself a relatively young discipline. So when did psychology really start to emerge as a science? Psychology originally had its earliest roots in philosophy and physiology. According to most psychology historians, it was the establishment of the very first experimental psychology lab that officially marked psychology's beginnings as a separate and distinct discipline. When exactly was the first psychology lab formed and who was responsible for this important event in psychology history? The question of which lab was first really depends on whether we look at experimental labs or teaching labs. It might seem like a minor distinction, but it was the formation of the first lab devoted to the experimental study of the mind that truly set psychology off on its own path as an academic and scientific discipline. 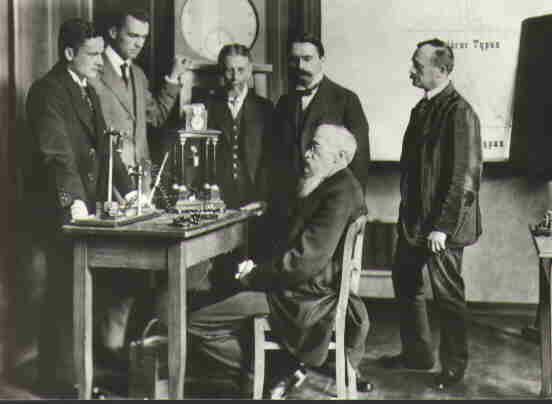 Wilhelm Wundt, a German doctor and psychologist (seated in photo), was responsible for creating the world's first experimental psychology lab. This lab was established in 1879 at the University of Leipzig in Germany. By creating an academic laboratory devoted to the study of experimental psychology, Wundt officially took psychology from a sub-discipline of philosophy and biology to a unique scientific discipline. Because of the important role that Wundt played in psychology history, he is often regarded as the "father of psychology." Wundt had a significant influence on early psychology and left his mark on some of his most famous students who included James McKeen Cattell and G. Stanley Hall. In addition to being an important figure in the history of psychology, many students were trained in his lab and went on to make their own important contributions to the field of psychology. The First Psychology Lab in the U.S. In 1883, Wundt's student G. Stanley Hall created the first experimental psychology lab in the United States at John Hopkins University. This helped mark the establishment of psychology in the U.S. and contributed to the further growth of the field. Wundt, James and Hall: Who Was First? It may surprise many to learn that neither Wundt nor Hall can exclusively lay claim to having the world's first lab or the first American lab. In 1875, a full four years before Wundt established his lab and eight years before Hall established his, Williams James formed a psychology lab at Harvard University. So why is James not credited with creating the world's first laboratory, or at the very least, America's first lab? Because his lab was used for teaching demonstrations rather than experimentation and original research. For this reason, Wundt and Hall are generally credited with creating the first and second experimental psychology labs. So why is the establishment of the world's first psychology lab so significant? Because prior to this time, psychology was still in is infancy and not yet viewed as a distinct discipline in its own right. By forming an experimental lab devoted to the scientific study of the human mind and behavior, Wundt was able to formally establish psychology as a separate field of study. Modern psychology is quite different from its rather modest beginnings in Wundt's lab. While this first psychology lab likely bears little resemblance to the labs of today, this early experimental setting helped pave the way for the future of psychology. By taking a scientific approach to the study of the human mind and behavior, Wundt's lab formally established psychology as a science separate and distinct from the fields of philosophy and biology. Wundt's lab was also used to help train other psychologists who went on to help spread psychology throughout the world. Soon, others labs began appearing outside of Germany and the United States, including psych labs in Russia, China, France, and Canada. Boring, E.G, (1960). A History of Experimental Psychology 2nd Ed. Englewood-Cliffs: Prentice Hall. Bringmann, W G, Balance W. D., & Evans R. B. (1975). Wilhelm Wundt 1832-1920: A brief biographical sketch. Journal of the History of the Behavioral Sciences, 11(3), 287–97. Shiraev, ER. A History of Psychology: A Global Perspective. Thousand Oaks, CA: SAGE Publications; 2015.